Ocean Trust has distinguished itself with award-winning projects to enhance fisheries, wildlife and the marine environment. We are committed to partnership building with seafood producers and conservationists, and to positive, results-oriented projects that help sustain the oceans and coastal communities that are dependent on the sea. Scientific assessments and workshops on the status and sustainability of fisheries and farmed products as well as projects to improve the sustainability of stocks through gear research, protected areas and tagging studies. Our Science & Sustainability Forum held annually with the American Institute of Fishery Research Biologists (AIFRB) brings international scientists and resource managers together to review the status and sustainability of seafood. The forum priorities sustainability issues and research needs, and seeks to improve public access to competent science authorities on sustainability issues. Over 85 presentations have been given covering fisheries from the European Union, Norway, Iceland, Canada, United States, Mexico, Russia, New Zealand, South America, Indian Ocean, Antarctic as well as global stocks covered by the United Nations Food and Agriculture Organization (FAO) and international Regional Fishery Management Organizations governing high seas migratory tuna and large pelagic fisheries. Combined with our own research, it forms the basis of sustainability profiles we provide to the public and our members. • Claims of the demise of fisheries based on projected catch and misuse of terminology have created confusion on the status of fisheries (Science Sustainability Forum 2012). • Catch levels have been lowered for 2/3 of global stocks by managementagencies to stabilize and promote stock growth (SSF 2012). • Abundance levels of global fisheries for which we have data have remained stable since 1980 (Worm et al. 2009, Hilborn 2012). • In most places where we have assessment data stocks are not declining, but increasing and overfishing is declining (Worm et al 2009). • Individual populations and catch composition vary by region, but globally fisheries productivity has remained stable since 1985 (FAO SOFIA 2010). • Fisheries under management can be sustainable even if stocks are not at highest levels producing maximum yields, MSY (Rothschild 2012). • Fisheries sustainability is best defined by the management system, not a snap shot of status or fishing levels (over/fully fished, etc.) at any point in time (SSF 2012). • Since the mid-1990s, several studies have predicted the rapid decline of marine fisheries worldwide. Paradoxically, total global capture data prompts a word that has very rarely been used to describe catch trends: stability (FAO SOFIA 2010). In addition to linking seafood buyers to reliable databases on seafood sustainability, Ocean Trust has profiled over 60 seafood species as well as consumer issues on the future of fisheries, endangered species and seafood sustainability. Updating and expanding species profiles are ongoing tasks as issues and interest demands. Ocean Trust provides funding to organizations like the University of Florida Gainesville, Fisheries Scholarship Fund, Gulf and South Atlantic Fisheries Foundation (www.gulfsouthfoundation.org/research/ongoing), Southeastern Fisheries Association to reduce fisheries bycatch, test new gear which may enhance quality and reduce bycatch mortality, collect empirical data on red snapper through tagging studies needed for stock assessments, support fishing community outreach to school children, and protect closed areas like Tortugas pink shrimp nursery area. Restoring endangered marine species populations. Ocean Trust is a long-standing, recognized partner in the restoration of endangered marine wildlife. 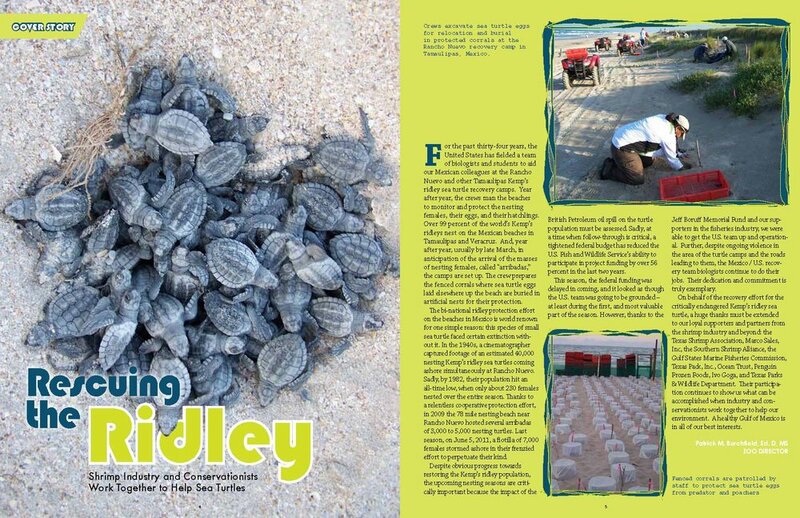 With support from Ocean Trust members, we have provided support to the Bi-National Kemp's Ridley Sea Turtle Recovery Program for the past twenty years. Sea turtle conservation is important to many trawl and longline fisheries which interact with sea turtles. Our funding keeps restoration and nest protection programs going and supplies equipment such as solar panels for restoration camps. At the same time, our independent assessments on shrimp fishery compliance with US Turtle Excluder Devise (TED) requirements provided additional documentation for the re-certification of foreign shrimp exports to the US. Without habitat, there are no fisheries. That is why Ocean Trust has a long history of managing and supporting projects to restore coastal areas for a broad range of fishery and other estuarine dependent marine species. Ocean Trust participates in Restore America’s Estuaries conferences with presentations and exhibits on many ongoing projects as follows. An Ocean Trust initiative to help restore coastal ecosystems and wetlands that support fisheries and marine wildlife in the Gulf of Mexico. The Ocean Trust facility will propagate coastal wetland plants, house a public native plant garden for educational outreach on the importance of wetland restoration, and restore critical habitat damaged by development, storm surges and oil spills throughout the western Gulf. An ongoing award-winning project restoring a 10,000 acre shallow water estuary which will support a wide variety of coastal fisheries, shrimp, crab, waterfowl and other marine life. Ocean Trust has and continues to serve as the leading nonprofit foundation in this public private partnership commonly recognized as the largest wetland restoration project in the US. This partnership includes many Ocean Trust members and supports. A recent shoreline stabilization to protect critical habitat for both coastal and upland endangered species.